All work and no play makes Wade a gray boy (or something like that). “You see this gray hair?” he asks, pointing to his ponytail. “My wife says I got it from working too much.” Wade Thompson, a 37 year-old McComb native and Fondren resident says, these days, a work/play balance is the key to his happiness. A 1999 architecture graduate of Mississippi State University, Thompson and wife Lauren (who both are in the same field) considered job offers and a move to Texas, but decided to stay in Jackson. “We didn’t love Dallas, so it was a no-brainer,” he remembers. “We said we’d be here a few years and save some money.” The couple has been here ever since. Thompson’s first project out of college was the Davis-Wade Stadium addition at MSU while at Foil-Wyatt Architects in Jackson from 1999-2003. But when his mentor left, he considered his options. That’s what brought him to Duvall-Decker in Fondren. Roy Decker had been a professor of Thompson’s. “It was an excellent work experience, but I was becoming one sided. I couldn’t leave it at the office,” he says. With 60 hour work weeks and convincing himself to just work harder to succeed, Thompson finally had had enough. “I see it now, very clearly. Life is too short and I need to enjoy it.” Wife Lauren was supportive and urged him to do whatever he needed to do. Lunch with two different architect friends on two different occasions ended with a bit of advice: call Wier+Boerner. Thompson remembers, “Both friends told me (Jamie Wier and Michael Boerner) were a couple of ‘young guys that just got started that you’d get along well with.’” When he called to set up a chance to meet, he realized they were right across the street at Fondren Corner. “We hit it off.” And in a small world twist, Thompson realized he had known Boerner from their youth soccer league days in south Mississippi. Since October 2010, Thompson, the studio manager, has been quality controller on most firm projects. He is one of the most knowledgeable with construction detail and administration in private developer projects, Wier+Boerner’s specialty. Thompson describes it as a very collaborative process and his role as more of a ‘behind-the-scenes’ kind of guy. All of this sounds very career driven still until you realize Thompson has, for the last several years, been working to remove himself from his work and be more a part of community. “While I was still at Duvall-Decker, I was concerned about the (lack of) energy of one of the professional organizations I was a part of,” he says. “It hit me: we’d been complaining about it for years, but, if I’m complaining, I need to do something about it.” Thompson’s need to be more proactive spurred from that, shifting from a professional focus to a community one. When Thompson and his wife moved into their Broadmeadow neighborhood home in 2009, they began to meet their neighbors. “I got a cold call from Chuck Wise (a long-time Broadmeadow resident) who said ‘You don’t know me, but I heard you just moved in and you’d be a great addition to our neighborhood association.’ I couldn’t say no.” Thompson says it was a fit. Four years later, he is the president of Broadmeadow Neighborhood Association. And, lest you think he’s just spinning his wheels, he’s teaching others to spin theirs, too, with the Community Bike Shop of Midtown. 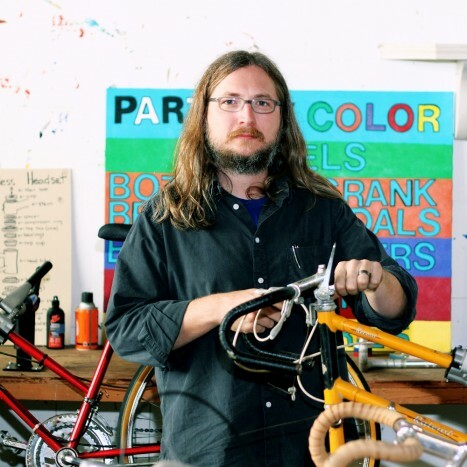 Thompson is one of the founders and clinicians in the shop made possible by Bike Walk Mississippi through MDOT’s Safe Routes to Schools. “It was like two worlds colliding: this desire to volunteer and help a community and a bit of a selfish thing of wanting to fix my own bike,” he says. Thompson found the tools he needed for his own success but is providing valuable lessons to students from Midtown elementary schools with after school bike safety and repair. “The goal is to teach them and to help them earn their own bike.” After ten hours of work is accrued by the student, they are eligible to pick out their own bike made of donated bikes and parts. This is wonderful and we are extremely proud of you. Your concern for others is a beautiful trait. Much, much love.